This fine young English ensemble was new to us last month, and we promised more from if they were warmly received (which they were!). NOTE: All of the music on this program is from the Marian Consort directed by Rory McCleery. II. 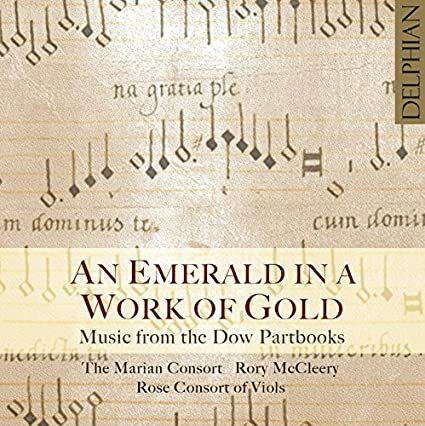 An Emerald in a Work of Gold: Music from the Dow Partbooks. Delphian CD DCD34115. For their second Delphian recording, The Marian Consort have leaved through the beautifully scripted pages of the partbooks compiled at the close of the sixteenth century by the Elizabethan scholar Robert Dow, to present a sequence of some of their brightest jewels. Sumptuous motets, melancholy consort songs and intricate, harmonically daring viol fantasies are seamlessly interwoven, all brought to life by seven voices and the robust plangency of the Rose consort of Viols in the chapel of All souls College, Oxford – where Dow himself was once a Fellow.